Thanks to Japan's unique business model and its people's firmly rooted industriousness, desolated post-WWII Japan achieved growth in only a few years. It goes without saying that Japan's research and development as well as its technological strength in the field of natural sciences were equally important in laying the foundation for strong economic growth in the 1980's and the decades that followed. With 9 Nobel laureates in science for the 2001-2011 period, Japan comes in the second position, in a tie with the United Kingdom. Starting with chemistry and physics, and more recently medicine, Japanese researchers greatly contribute to scientific development worldwide. So why not consider experiencing the Japanese educational system? ※ The results are calculated on a “country of origin” basis. According to the World Intellectual Property Organization (WIPO), Japan has taken the second spot and a large advance on its runner-up regarding the number of Patent Cooperation Treaty (PCT) applications. We can also notice the impressive amount of patent applications filed by Japanese companies in fields such as environmental technology (fuel cells, water treatment, etc. ), IT technology (electronic paper, Internet television, etc. ), medical technology (medical imaging, etc. )… This serves as proof of Japan's propensity to develop new ideas and produce new devices. These achievements are made possible by Japanese universities! According to the 2011 edition of the world famous QS World University Rankings, 24 Japanese universities are listed in the Top 500, making Japan the No. 1 country in Asia. 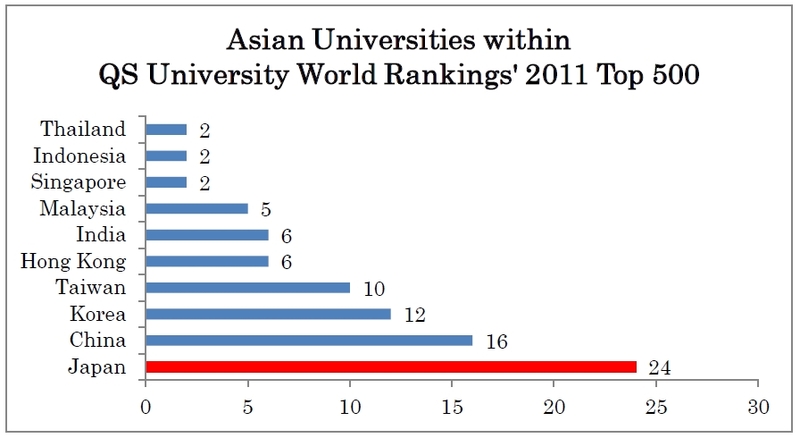 The particularity of the Japanese institutions, compared to that of other countries, is that a wide variety of universities made it on the list, regardless of their location and scale. This allows us to take a peek at the competitive power of Japanese universities which possess research facilities and education institutions adapted to their regions' characteristic traits. There definitely is a campus that fits your needs in Japan! The value of these 24 universities can be observed through the high number of research papers published in Japan, first and foremost in the field of technology. From 2000 to 2010, approximately 750,000 papers were published, making Japan reach the second spot, only losing to America. The number of research papers expresses a country's ability to develop cutting-edge studies, thus showing Japan's high ranking in the world of research. In addition, as one of the developed countries to encounter issues such as decreasing birthrate, aging population and serious environmental problems, every Japanese university has swiftly developed new domains of study. Of course, you can also choose to focus on visual arts best displayed by the ever so popular Japanese subculture! Furthermore, since the language barrier is no longer a problem, you can now study cutting-edge techniques to your heart's content and work together with Japan's top students and researchers.